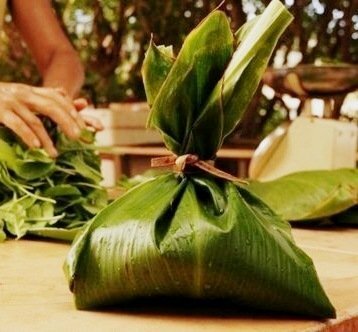 This popular dish actually can be found in varying forms across Polynesia and Asia. Fiji versions may include corned beef, tomatoes and garlic. The Fillipino version is called Laing. But the original dish I fell in love with was a simple vegetable medley. Imagine my joy when I found out how easy it was to prepare! 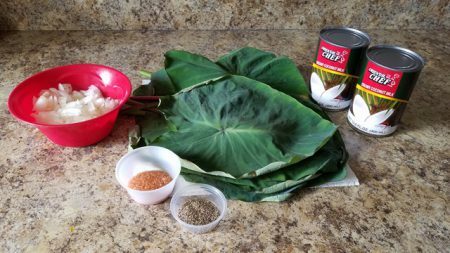 The best part is that you too can prepare this great dish, even if you do not have access to the fresh, young leaves of island taro. With this recipe you will find three variations, the standard recipe, the truly island style and the super easy mainland version. Hope you enjoy it as much as I do! NOTE: It is VERY important that you get young, smaller leaves. All taro leaves contain calcium oxalate, which in it’s raw form irritates your mouth, throat and possibly stomach – feels like scratches or sores. Your tongue can also swell and you may lose your sense of taste. A little underdone is irritating. A lot (or raw) is downright dangerous! 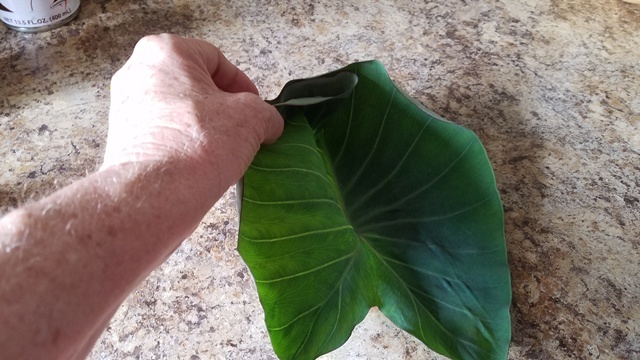 Thoroughly remove the thick stem on the back including the round section that attaches to the leaf. Some Polynesians suggest that you also cut off the tip of the leaf. Make sure to wash the leaves thoroughly. This recipe includes instructions for steaming and for oven baking. 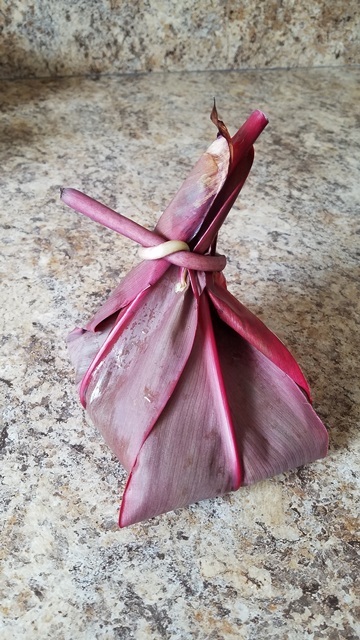 Young taro leaves (make sure that the stem is still green, if it’s red, do not use it) You will need 4 – 6 leaves for each serving, depending on size. So, if you are making 8 servings, you will need 32 – 48 leaves. 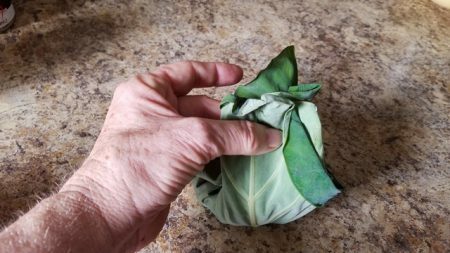 Take the washed and dried taro leaves and begin building a bowl on the palm of your hand. Notice how fresh these young leaves, straight off the plant, are. Leaves from the store tend to be a bit more ragged, but they still work. Using the largest leaf on the bottom, begin stacking leaves on top, each smaller than the other. You will want to use 4 – 6 leaves each serving. 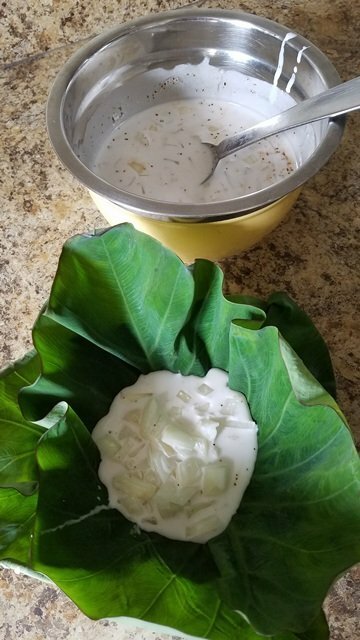 Now, spoon the coconut milk mixture into the bowl of the taro leaves. Fill it up about half way, maybe a cup or so, but not so much that it overflows when you wrap it. Wrap your palusami in foil making sure that the sides all come together at the top. 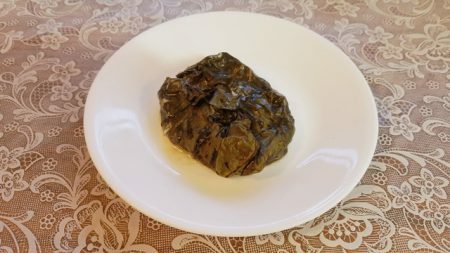 For true island flavor, Samoan palusami is cooked in an umu, but most cooks do not have a pit oven available. Not to worry! 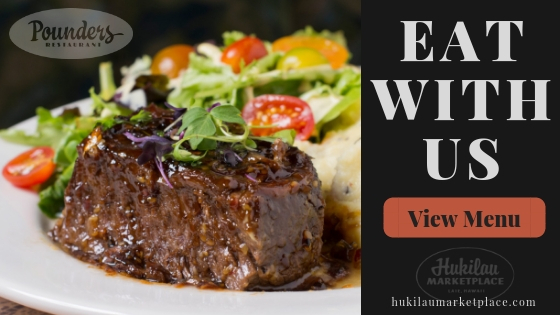 An electric steamer is the most common method for many Polynesian families, and it makes the dish guaranteed tender! Simply place prepared palusamis in the steamer with the required amount of water and cook for at least 4 hours or more. 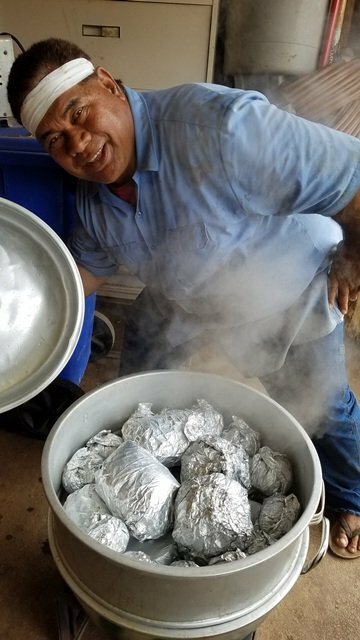 Ulu Tauvau, who served as our resident Samoan food preparation expert, shows how he steams palusami. 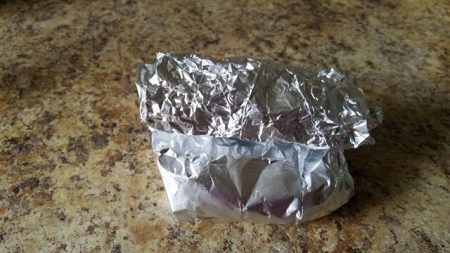 Now place each packet side by side and cover it with another sheet of aluminum foil. Crimp it around the edges for a good seal and cook at 350 degrees for at least 3 1/2 – 4 hours. VARIATIONS: Making it really authentic! 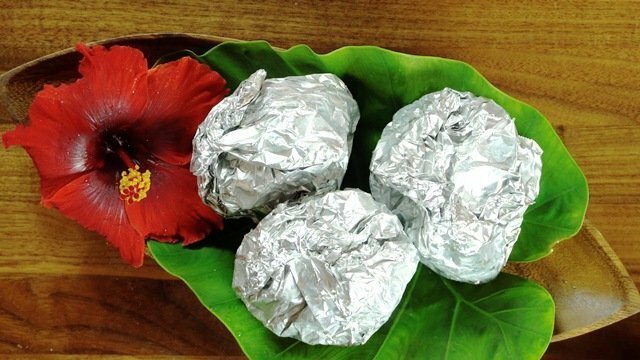 To enjoy your palusami with a true island flavor, instead of using aluminum foil, take one or two ti leaves (depending on size) and wrap them around the prepared palusami ‘ball’. Use the stem, which is very pliant, as your tie. Then just place in the electric steamer as before. 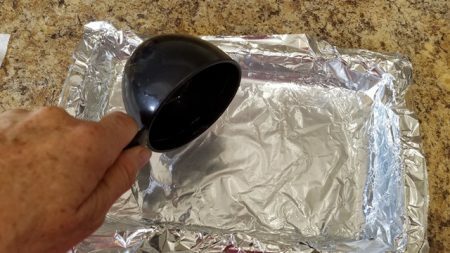 NOTE: If baking in the oven, you will still need to add water to the pan and cover it with aluminum foil. Spinach Palusami – The easiest variation of all! 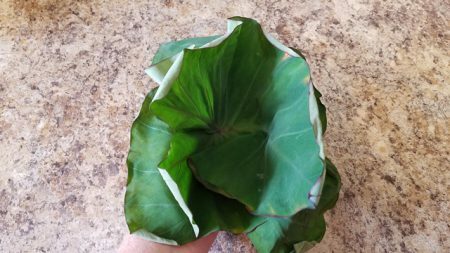 For our mainland fans who may have a difficult time finding fresh taro leaves, simply use spinach leaves! You will need a lot, so get at least two bunches. 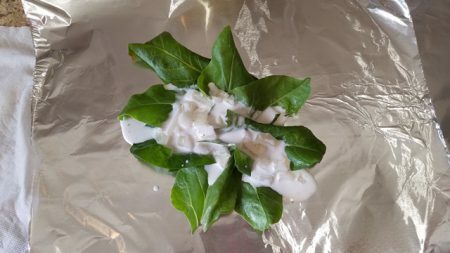 You can use aluminum foil to make individual servings (I’d use a lot more leaves per serving than pictured here) or simply place your leaves in the bottom of a baking dish and pour the coconut milk mixture over the top. Cover with foil and cook until tender (if using spinach, 1 hour should be plenty of time). Placing the ingredients in a crockpot on low for a few hours is another popular way to prepare it. No matter what method you use, you are sure to enjoy this tasty yet healthy dish. Nina Jones, a mainland gal from way back, is now a transplanted Islander. With her husband of 40+ years, she volunteers at the Polynesian Cultural Center. Her hobbies include swimming, traveling, studying and writing about what she is learning from the various Polynesian cultures. 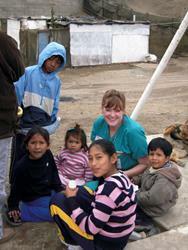 Her blogs focus on their history, beliefs, practices and – as an added bonus – delicious food! To her, Polynesia is not just a place to visit, it is a way to live and she is very honored to be able to be a part of this amazing world.